Purple amethyst, handmade lampwork glass, and gold beaded necklace. This one-of-a-kind necklace is adjustable length from 21" to 22 3/4". There are nine gorgeous American handmade borosilicate art glass beads in shades of raspberry, melon, purple, teal, and gold. These glass beads are in four matching sets of two, plus a spectacular center focal bead that looks like it has an electrical firestorm swirling inside. Four amazing glass beads are divided into many delicate sections with a small air bubble placed in the middle of each section. All of the glass beads are encased in a layer of clear glass for added depth and sparkle. 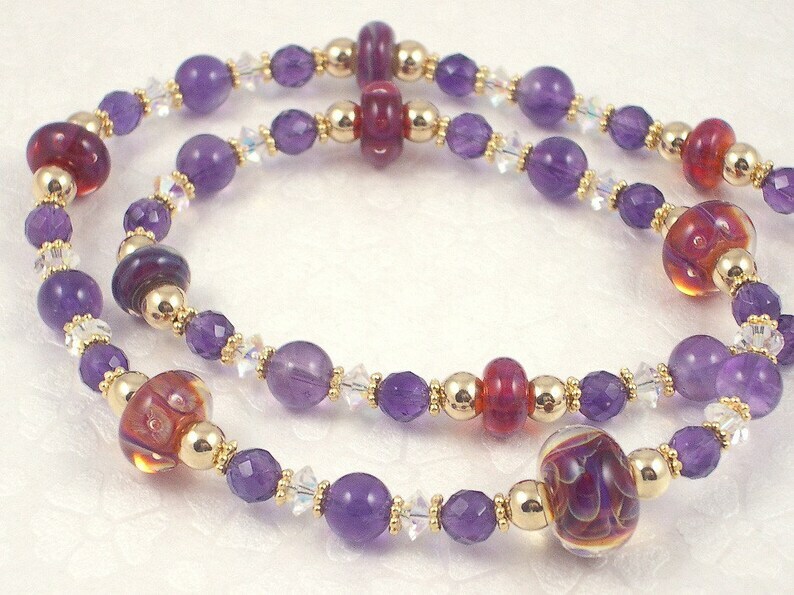 The handmade glass beads are combined with faceted and smooth purple amethyst gemstone beads, large 14KT gold filled beads, sparkling Swarovski crystals, and gold-plated lead-free pewter spacers. The clasp is a 14KT gold filled lobster claw with a matching 14KT gold filled adjustable chain that ends with an amethyst and crystal charm. This necklace is strung on super strong and flexible 49-strand stainless steel cable that is nylon coated. RazzleBedazzle's Luxurious Purple Amethyst, Pink Topaz, Ruby Quartz, and Gold Cluster Earrings would go beautifully with this necklace. See all of RazzleBedazzle's lampwork glass jewelry and suncatchers!